I took 8 years of backlog building experience and stuffed it into a new and exciting book and course. 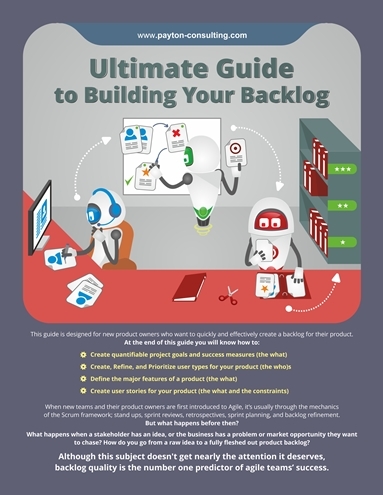 This was created because I saw so many product owners struggle with building backlogs. When I would work with new teams, they would be excited for the possibility of what Agile could bring, but that excitement soon would turn to horror as the team was forced to try to consume backlogs in horrible condition. Imagine buying a brand new house only to find the foundation was cracked, the beams were rotten, there were mice living in the walls, and termites were eating the roof. This is what a poorly created backlog feels like to a new team. A team that is forced to work like this will be demoralized and demotivated. It certainly does not set the stage for a productive, excited, engaged team. This material will show to take all the thoughts and information in your head and create a crisp, clean, prioritized backlog for your team. You will be able to smoothly negotiate the rough spots with your team and stakeholders? It’s not just about “building your backlog” — it’s about making your stakeholders and teams happier, which in turn makes you more respected by them and gives you the reputation as the go-to person when the stakes are high and the project is important. My comprehensive course is guaranteed to help you totally transform how you build backlogs, or I’ll refund you in full.